Port Orford Cedar arrows and shafting have played an important role in the history or archery. It is with good reason that these arrows have been the number one choice of so many legendary archers through the years. For instance, one of the greatest archers of all time, Howard Hill, insisted on using only Port Orford Cedar for his best target and bowhunting arrows. Bearpaw Products and Rose City Archery are committed to making these amazing wooden arrows of the highest quality available to all archers again! There are two important reasons for the archers of today to make the choice to shoot wooden arrows, even though there are so many other modern and artificial materials available. This is especially true in the long bow classes, it is mandatory to shoot wooden arrows in many tournaments and championships. For wooden arrows, the best arrows have always been made from Port Orford Cedar. Cedar wood arrow are clearly the first choice in wooden arrows. The unique features of Port Orford Cedar arrows allow the arrows to stabilize extremely fast. Thanks to its excellent modulus of elasticity, Port Orford Cedar guarantees high flexibility and has always displayed a willingness to stay straight for a long time! Our ‚premium‘ quality Port Orford cedar shafts are all spine matched and sorted to within 5 pounds. Premium Port Orford cedar shafting is much straighter than other shafting and much more willing to be straightened and stay straight than other shafting. Even the growth rings are more consistent than in other shafting. Special Savings! We have a special arrangement with Rose City archery on 30" premium quality Port Orford cedar shafting - and a special price! It is well known that 30" shafting is perfectly suitable for most archers and bowhunters. We offer 30" premium Port Orford cedar safting from Rose City Archery, the best in the business, at big savings to you! If you like saving money, and 30" shafting will work for you, order yours today. You'll get the best quality Port Orford cedar shafing available anywhere at the best price ever!! Henry Bodnik highly recommends wooden arrows made from quality Port Orford Cedar! 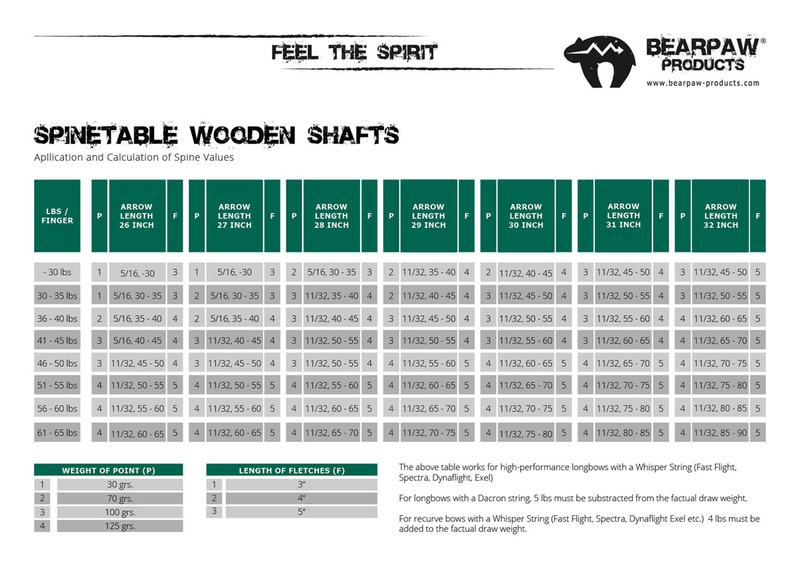 Need help choosing the correct spine for your wood shafting? We are happy to assist you! To access Henry Bodnik's compehensive spine chart for wood shafting please click on the button below.